We all know that it’s important for older people to remain active, in order to stay in shape and fight off any potential medical conditions. On way of doing this is by taking up a new sport, and racket sports such as squash are providing the most benefits. We briefly talked about the game of squash in our “top 5 sport and fitness activities” blog post, however today’s post will go into more detail, explaining the rules and benefits of the game. Squash is a fast-moving racket sport which can be played by two people in a singles match and four people in a doubles contest. The game is played within a four-walled court, with a small, hollow rubber ball. Both players are also equipped with squash rackets. The game of Squash is a great upper and lower body workout, strengthening muscles and burning up to 800 calories per hour – perfect for older people who are looking to stay healthy. Remember, the NHS advise that older people looking for a more intense workout routine should aim for 75 minutes of vigorous aerobic activity, and strength exercises on two or more days a week that work the major muscles in their body. Cardiovascular – You’ll be running, leaping and diving for that ball. Of course, you’ll also be improving your hand-eye co-ordination and agility on the court. Your brain will constantly be working as you try and work out how and where to hit the ball, in order to gain an advantage over your opponent. Concentration is key during a game, you’ve always got the be thinking ahead and you look to out-smart your rival – you cannot take your eye of the ball for a second. 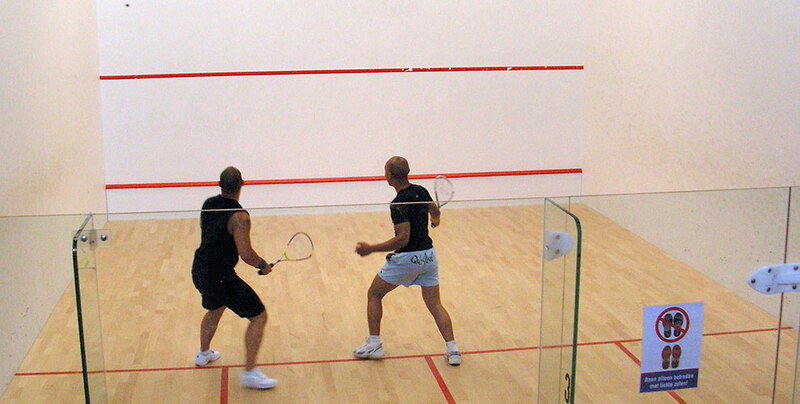 Playing a game of squash can also help to reduce any stress that may have built up during the day or week. Much like going to the gym, taking your anger out on the squash ball is a great way of releasing any stress. Away from the physical side of things, playing squash is also a great social activity. You need at least two people to play, which means you’re either going to be taking a friend with you or making new ones at your local sports club. Having an active social life is important as you age, as you look to make sure that you don’t become lonely. You’re bound to make new friends at a squash club, as you already have one thing in common with everybody there. Each player in a game of squash will need their own racket. Generally, these rackets have a long handle and a small head. Just like tennis rackets, there are several different brands, sizes and weights available on the market. Alongside your racket, we would also advise wearing eye protection. As we’ve already mentioned, the squash ball can reach speeds of over 100mph and it will cause some damage if it hits you in the eye. Eye protection is mandatory in all official competition matches. Look for the British Standard BS7930.1 Squash on any eye wear you purchase to ensure the right quality. In terms of clothing, we suggest going for comfortable sportswear. You’re going to be moving around a lot, so make sure your trainers are comfortable. Perhaps use running shoes, or trainers which soft innersoles. A lightweight sporting t-shirt and shorts, along with sweatbands would be a good idea. Pro Balls – Used by elite/professional players. These balls feature distinctive double yellow dot markings. Competition Balls – Perfect for regular/club level players. These balls feature a single yellow dot. Progress Balls – Perfect for improving or recreational players. These balls are slightly larger, bounce more and are black in colour. Max Balls – Perfect for beginners. These balls are even bigger, bouncier and are black with a blue dot. The basic premise of the game is quite simple; you need to hit the ball against the front wall until your opponent is unable to return it. Of course, there are rules within this premise that you need to follow in order to win. The front wall features an outline and a service line. When you serve, the ball needs to hit the front wall between these two lines. The server must also remain in one of the two service boxes whilst serving – the server can choose which one to start play in. On the balls return from the front wall, unless volleyed, its first bounce needs to land within the back quarter of the court opposite to the server’s box. A player fails to serve or return the ball during a rally. The ball in play touches the other player or anything carried or worn by the other player whilst on the way to the front wall. A player drops the racket, calls out or in any other way distracts the opponent, and the referee considers that such occurrence has caused the opponent to lose the stroke. The ball hits the ceiling or any object outside of the court. The ball is only allowed to hit the floor once on each shot, however it can hit as many walls as you want. You will need to make sure that you hit the wall above the board and below the out line. During a game, you must make every effort to make sure that your rival has a fair view of the ball. You must also make every effort not to interfere with, or crowd, your rival as he or she attempts to get to, or play, the ball. Please see the video below, provided by England Squash, for a general overview of the game.